City of Spokane Use of Force Commission, Final Report. This is the report issued in 2013 in the aftermath of the SPD’s killing of innocent Otto Zehm and the subsequent cover up and general disrespect of the people of Spokane by the SPD. Inlander’s coverage of the 2013 report. Read the full report for yourself before you look at the 2014 presentation. As a footnote to last year’s final report, remember that a former City of Spokane attorney routinely filed lawsuits against anyone making a complaint against the police, cutting off an important data point to recognize SPD problems. This past week, the city presented a one-year progress report. The presentation is a public-relations sales pitch, bundled with propaganda. Lots of photos of happy smiling faces. Fits in to the general theme of over the top propaganda throughout Spokane’s culture. The more useful document is the 12 month progress report. As you read it, compare each recommendation to the problems detailed in last year’s report. This chart comes from the Calculated Risk blog and shows the impact of the Great Recession on U.S. non-farm jobs, compared to other recessions. 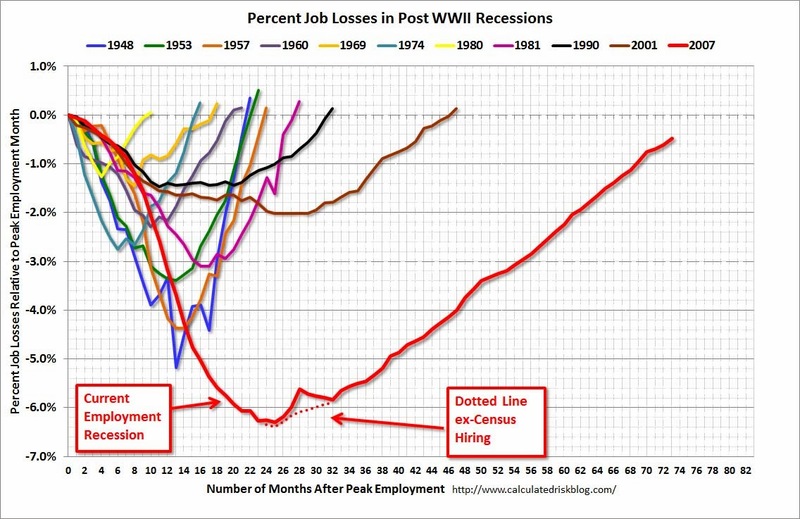 As of today, the US has recovered almost all of the jobs lost (see red line) and by the next update, next week, will likely have recovered 100% of the jobs lost. Spokane County has recovered just under half of the jobs that were lost. The Great Recession began in November of 2007. This chart shows non-farm jobs from January 2008 to the present. Spokane County’s job recovery is very weak relative to the nation as a whole. 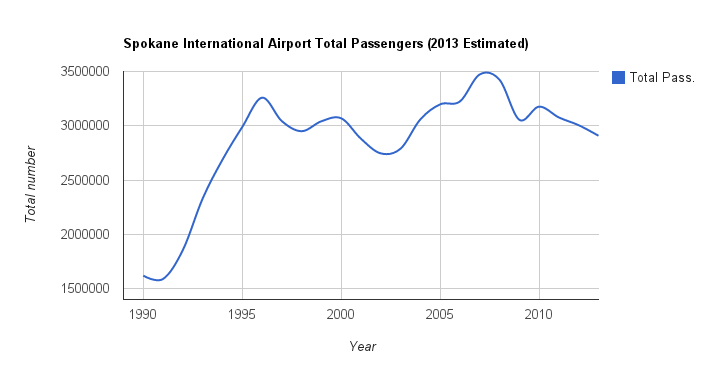 The chart comes from the US Bureau of Labor Statistics. Prior blog post on this topic – certainly relevant today: Police shootings in Spokane, by the numbers | Spokane Economic And Demographic Data. Video shows robbery suspect shot, killed by Spokane Police | Spokane/E. WA – KXLY.com. Here is an audio trace made from the video shown by KXLY TV and KREM TV. Click on the image for a larger view. Timing marks are minutes:seconds:frames from the start of the video clip. There are 30 frames per second. 3.03 seconds from time he appears visible in camera view (hand seen) at the door to last shot fired. 2 seconds – total duration of shooting. News reports say 14 shots fired. The words “Drop it” are not audible on the recording (this does not mean they were not said but they are not apparent on the recording). They may have been shouted at 01:07:12 to 01:07:19 but were unintelligible to my ear; shots were then fired at 10:08:01 which is less than 1/2 second later (faster than the suspect could have reacted). Note: Time units may be off by 1 or 2 frames (each frame is 1/30th of a second). Seconds are approximate and rounded based on the frame by frame analysis. Spokane Propaganda-style never goes stale! The logos of all three locations are prominent here. Don’t bring your own food to the Convention Center because apparently that’s dangerous; the other two venues allow you to bring your own food. As reported here previously, the 2007 economic study attributed all of the economic benefits to the Convention Center. But its right and proper when you use Spokane Propaganda-style to hide the decline in attendance. The last time the Spokesman-Review accurately reported on declining Convention Center attendance was back in 2005. This story is obviously off limits. But apparently media’s shredding of their own credibility is not off limits, since that is what they are doing. Too bad. This is not about whether the event is good or not (obviously its good!) or whether having the Convention Center in town is good or bad. This is about hiding the decline in attendance from the people of Spokane while repeatedly expanding the facilities. The most direct and honest objective measure of management success is – attendance – which is in a long term decline. But don’t tell anyone! Keep this a deep secret please! After an officer involved shooting, we should wait for the results of the investigation before passing judgement. Recently, an officer involved shooting took place in Spokane Valley. Sadly, it appeared to be “suicide by cop” by a heavily armed individual who had telephoned 9-1-1 with his intentions. Not much controversy there. We all have sympathy for the victim, the victim’s families, the deputies and their families. This must be awful for all involved. Days after a shooting, law enforcement issues a press release with the names of the officers or deputies. These releases routinely list the training, commendations and awards, and sometimes past work experience of those involved. SPOKANE, Wash. – The Spokane County Sheriff’s Office is releasing the names of the deputies involved in the shooting incident that occurred at Sullivan and Indiana the night of February 11, 2014. The SIRR Team’s investigation of the incident is ongoing. No additional information is available at this time. Did you spot the single line on Deputy Brian Hirzel? That is odd for a deputy that has his very own topic page at the local newspaper! From public records, Deputy Hirzel has been involved in three officer involved killings (2 by gun fire, one by hand). While the investigating agency announced he would be interviewed 3 days after the Creach shooting, the deputy was on vacation to Las Vegas, one of many factors that created controversy and cynicism. There is a Mr. Hirzel that is also founder and principle investigator at Critical Investigations, LLC, a private investigation service in Coeur d’Alene, Idaho (See additional footnote below as the web site appears to have been taken offline after this post). Another of the deputies was involved in a previous shooting too, and this is not mentioned. The Spokesman-Review read their own archives and pulled up the missing details. Leaving out inconvenient detail is called “lying by omission“. No one actually lied, no one said anything that was not true. But the intent is to influence by giving part of the story in a way to intentionally misrepresent- in other words, it is propaganda. 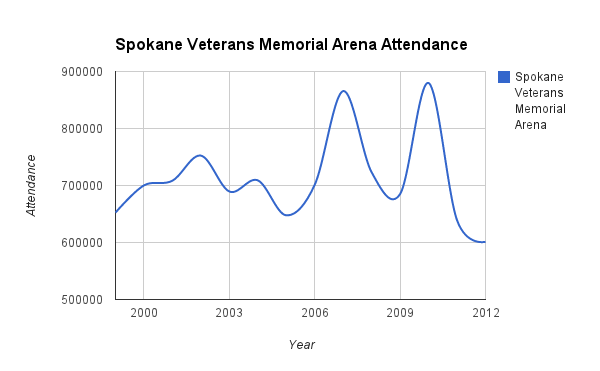 The recent news story about the Spokane Arena left out the most important metric of all – the long term downward attendance trend and that attendance for 2012 is almost 1/3 less than the peak. Dissembling is where true facts are presented in a way or in an ordering intended to lead one to an untruthful conclusion and is a common method used in propaganda. This is what we call Spokane Propaganda-Style! This blog post is not about the officers involved or whether the shooting was justified or not – this story is about Spokane Propaganda-Style. Propaganda leads directly to cynicism and a loss of trust in local institutions and leaders. Just wanted to clarify that we did not haphazardly link to a random web site. 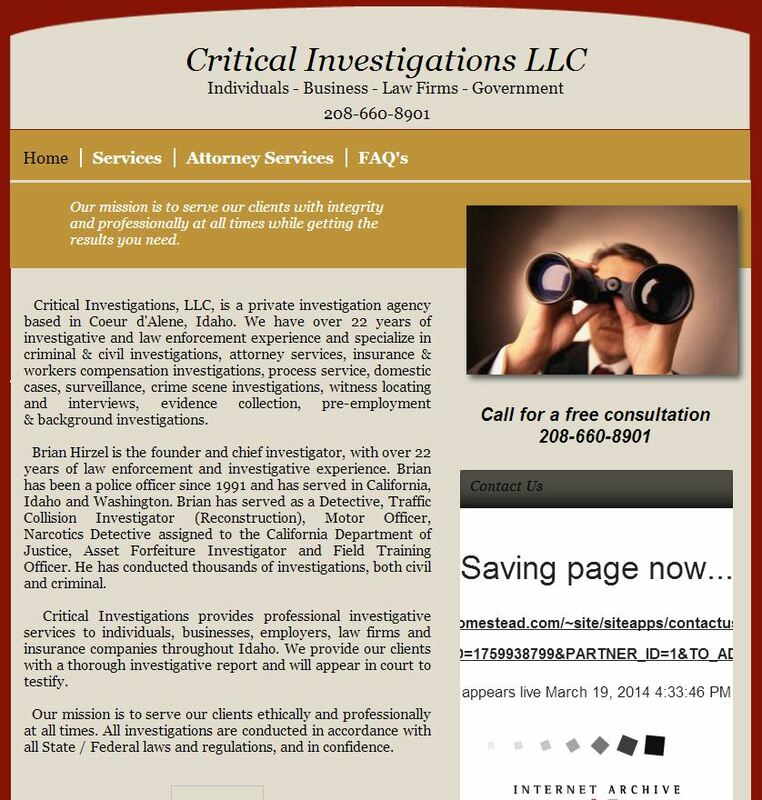 Deputy Hirzel’s LinkedIn page has a link on it to the Critical Investigations web site – see “Websites Company Website“. Portions of Deputy Hirzel’s LinkedIn page have almost identical wording to that used on the Critical Investigations web site. The Critical Investigations web site appears to have been taken offline after this post was made here on this blog. Here’s the chart and the rest of the story at the link. All data comes from public domain sources including Eastern Washington University. Here’s the propaganda spin in the Spokesman-Review because, you know, this is Spokane. Attendance trends are only hinted at in a single sentence near the end of the story where they write “Average attendance from 2008-2012 was just over 700,000 people, peaking in 2010 at 879,813“, giving the impression that attendance is growing, which is false. Nothing in the story disputes that attendance remains down over the long term in spite of numerous facility upgrades. Patrick Jones of EWU says there may be higher spending than in 2010. He must be hypothesizing per person spending has gone up (likely). But compare the 2010 attendance peak with 2012. The writer appears to have taken this quote out of context to give the impression that the Arena is bringing in more money than in 2010 – but with one third fewer attendees. Since the Chiefs and Shock account for about 364,000 fans per year (more than half of the 2012 attendance), and they attract a mostly local crowd, this means locals account for a larger percentage of attendance than in 2010 during the national skating event. And that means less outside money is coming to town. Local money is mostly re-arranging spending from one local place to another. The SR’s story reinforces a major point of this blog – distortion and exaggeration remain alive and well! We were about to make some posts about the Spokesman-Review recently descending into propaganda mode, but they just made the point for us! The SR scored their “own goal” by scoring a point for the other team 🙂 Hilariously funny. The end of the story hints at what’s coming: the Arena is 18 years old and the PFD will need taxpayers to build an even bigger arena in spite of declining attendance. This propaganda piece is battle space preparation. What steps are management taking to reverse the attendance decline?